In case you can't tell, I'm pretty excited for Animal Crossing: New Leaf. It took long enough for this one to come out in the west that I had to resist picking Wild World back up and burning out on furniture collectin', bug huntin' and letter mailin' before the game even came out. 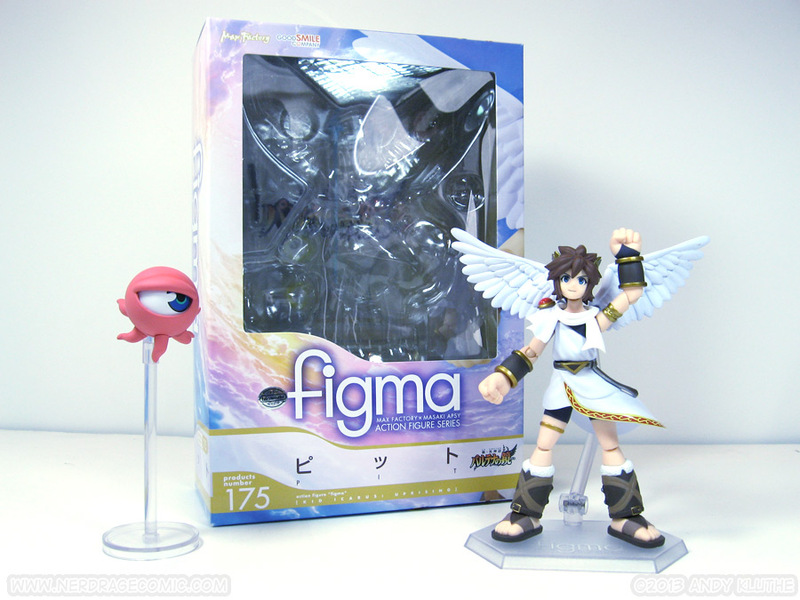 And be sure to check below for a review of Figma Pit from Kid Icarus! As teased at the end of the Revoltech Snake review, here's Figma Pit. 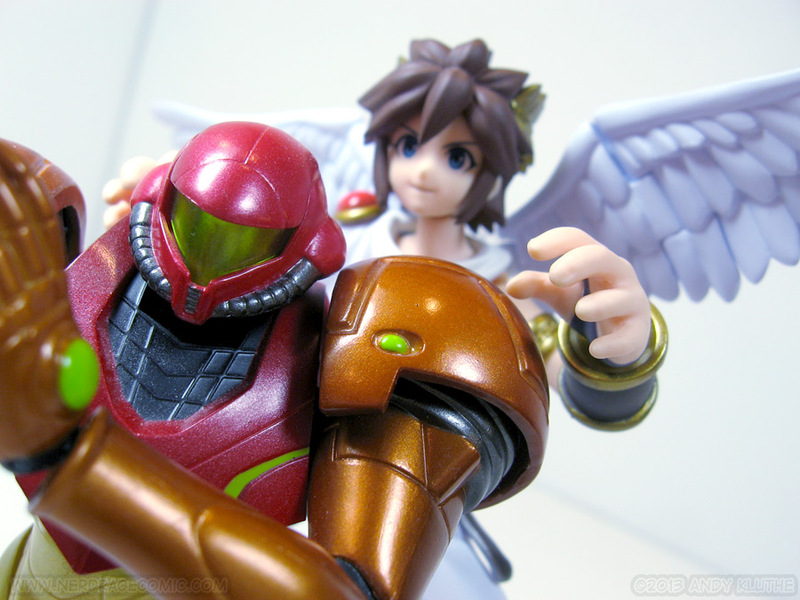 In the past I've reviewed one other in the Figma line: Samus Aran from Metroid. 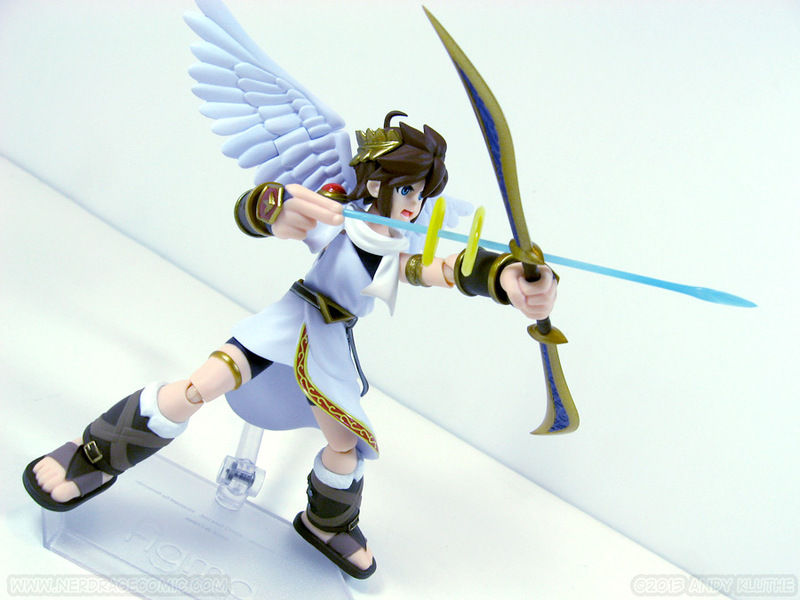 Max Factory, like Kaiyodo's Revoltech line, has its own proprietary joint. Unlike the revolver joint, though, Figma joints are smooth and there is no ratcheting. Rather than a ball, they're slightly squashed in shape, fiiting more comfortably into thin elbows and ankles, and the peg on either end means some form of swivel from either side. 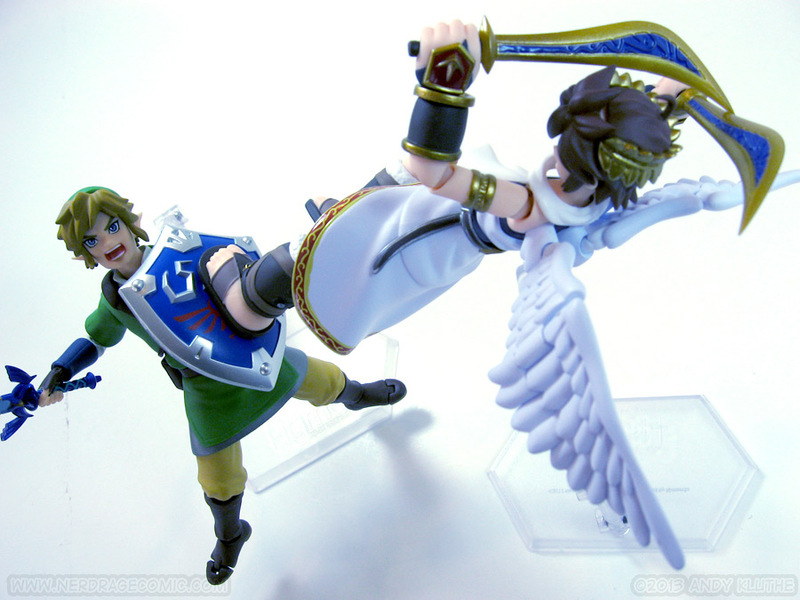 The articulation on Pit is by no means bad, but it leaves something to be desired. His toga inhibits a lot of movement. 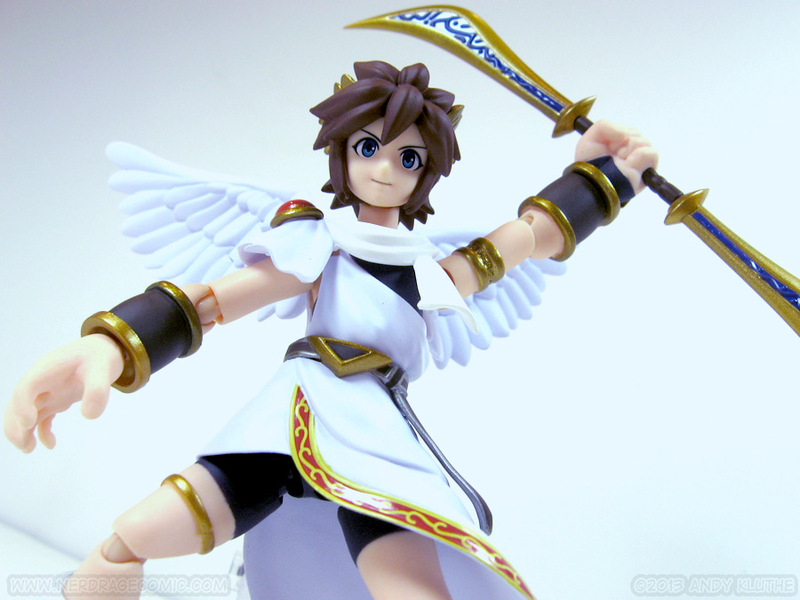 You have a firm rubbery material that slightly restricts his legs (a given, based on the Pit’s toga), and some more material draped around his neck and right shoulder, molded in a pliable rubber. The latter creates the biggest issues. 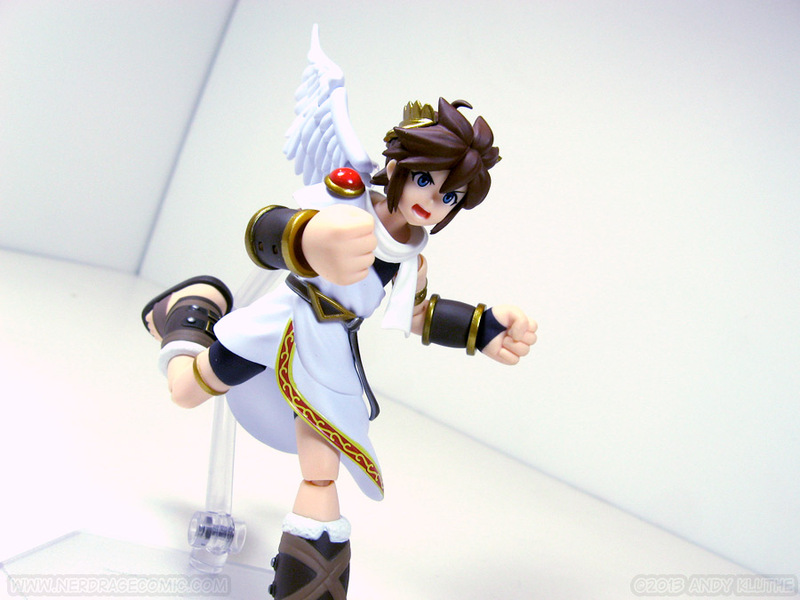 Anything that would involve Pit’s arms going straight up is now impossible with the right arm. 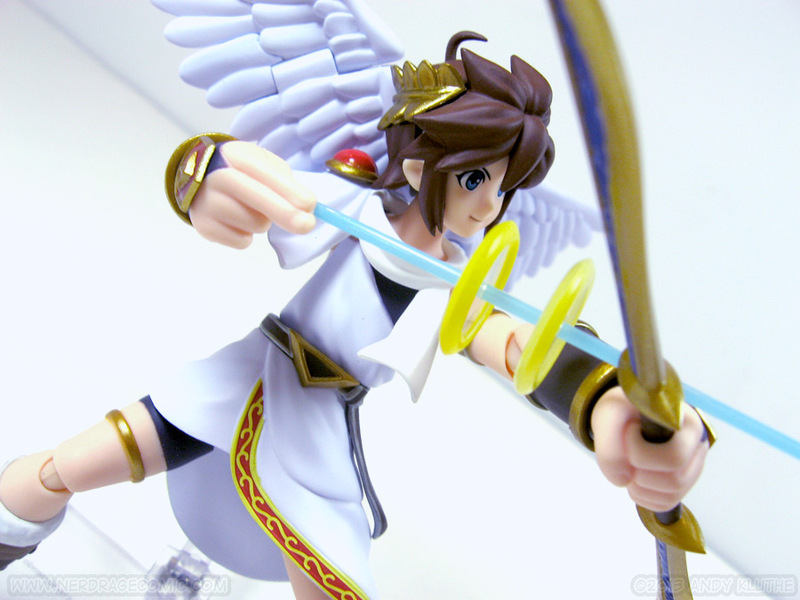 Getting his arm back in a believable bow-drawing motion is difficult with an arrow the size of the one provided and limited shoulder motion..
As you may notice below, Pit’s hands have holes instead of pegs like the usual Figma hands. I have no idea why this is, but without individual hinges below each palm, he loses a lot of maneuverability in his chubby l'il hands and ankles. He has a double ball and socket in his torso. I only know this because mine is so loose it pops out on a regular basis. 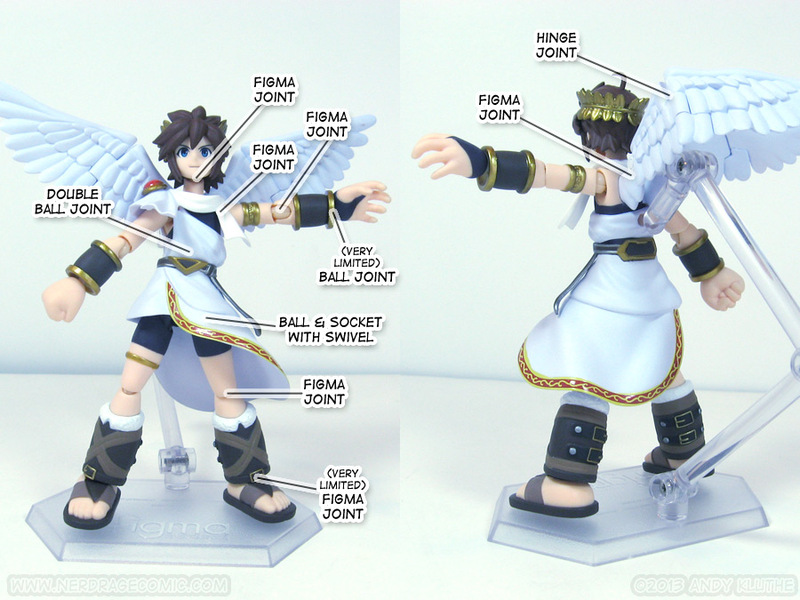 That being said, the Figma joints in the base of each wing and the middle hinge provide a surprising range of wing articulation. 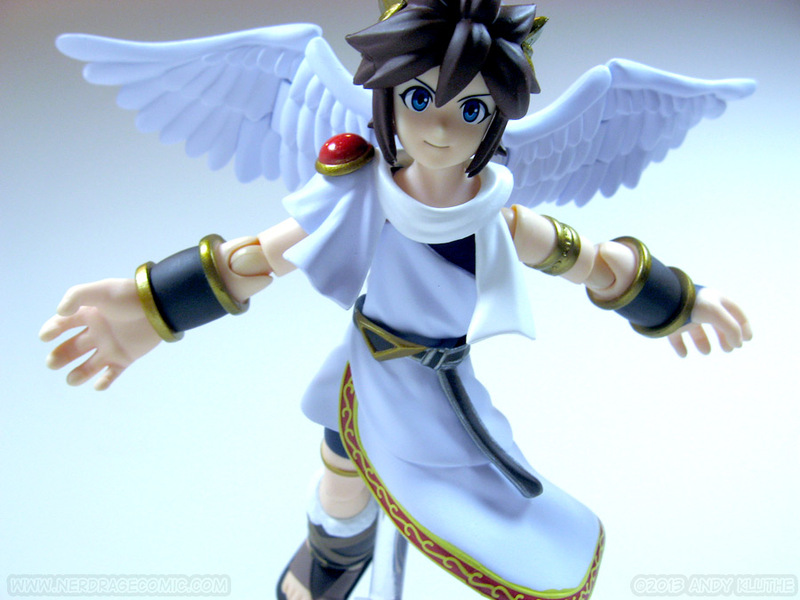 Pit’s sculpt is good – accurate to his appearance in Kid Icarus: Uprising and Super Smash Bros. Brawl. Good Smile Corporation does a fantastic job sculpting anime faces. The paint is all applied in a clean fashion and looks good. As I mentioned above, the toga and draped material are sculpted in a softer rubber to leave pliability. 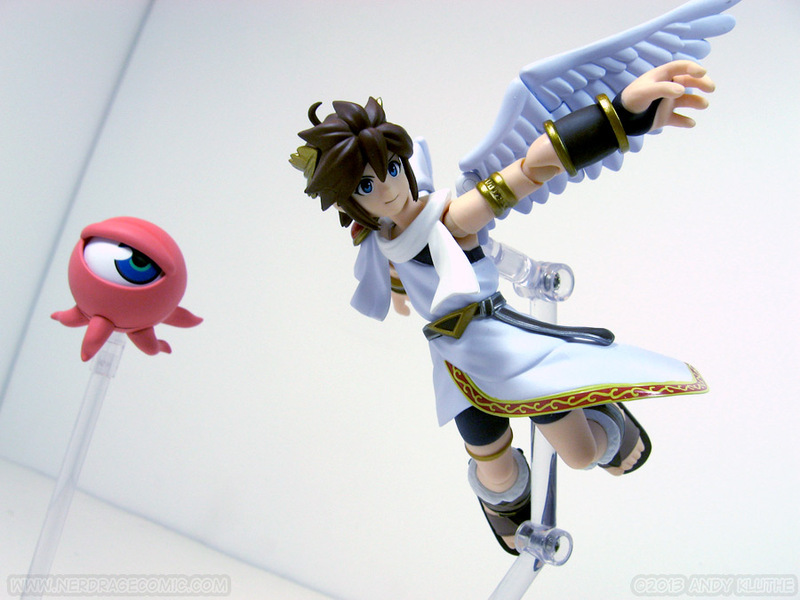 Pit’s a fair bit shorter than Samus and Link were. To compensate, there’s a mooneye enemy included with his own stand. If you turn one tentacle, the eye can be moved around. 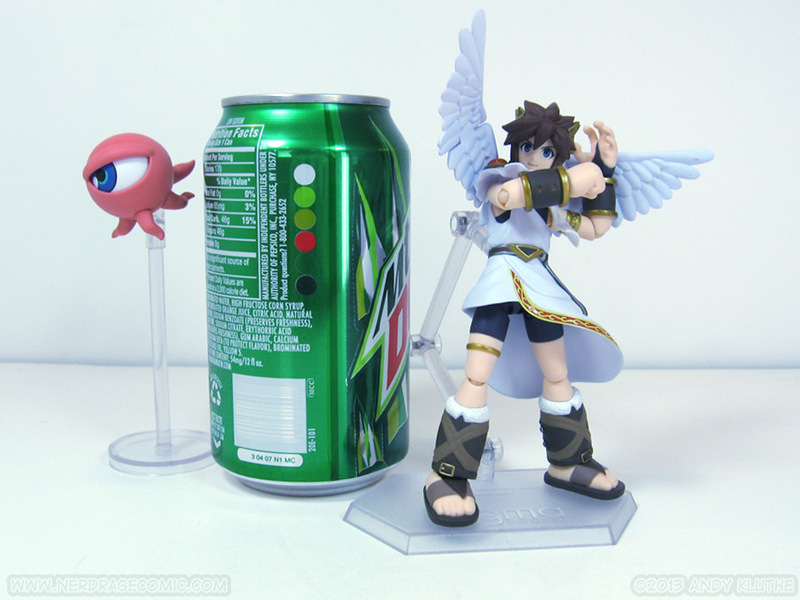 I’m iffy on the rest of Pit’s equipment. 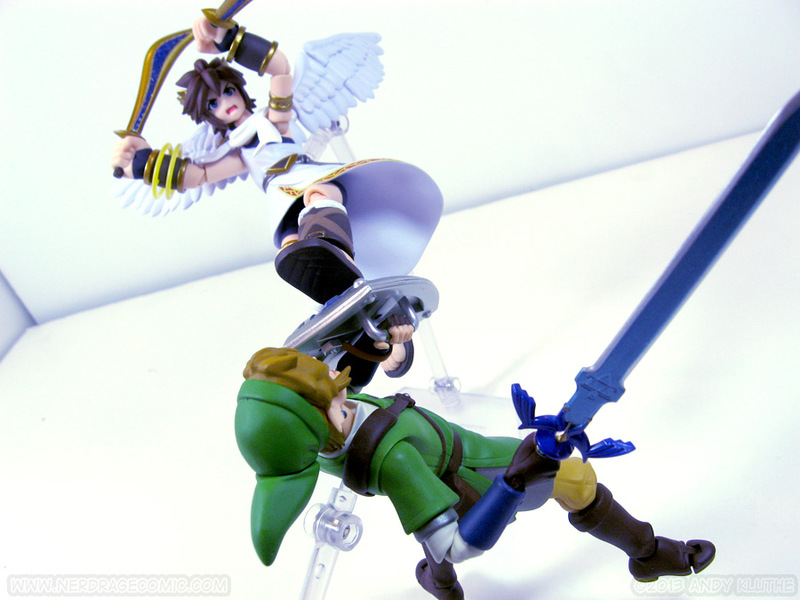 As in the game, Palutena’s bow can be split into two swords. So instead of a bow and two swords, you get two blades with one long connecting handle and two short sword handles. 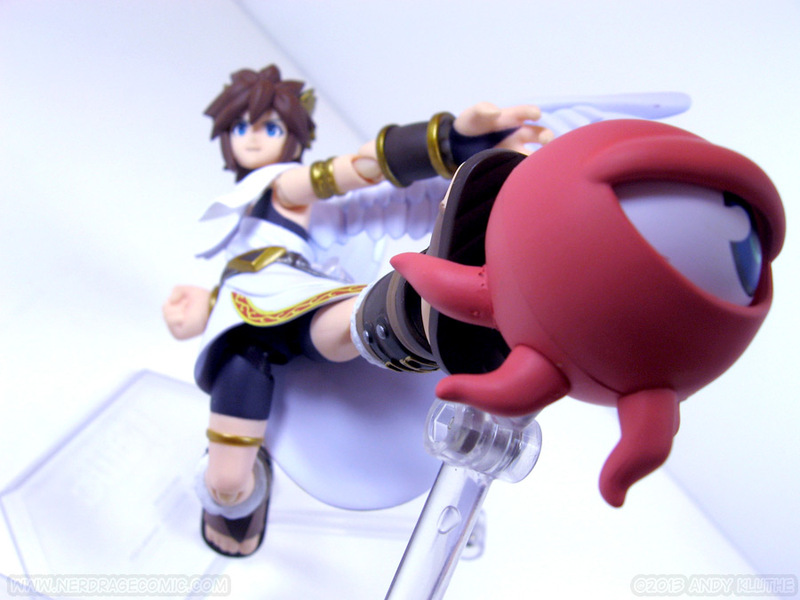 I cannot stress enough, be very careful and go slowly when inserting the bow handle into Pit’s hand. Mine was a very tight fit. 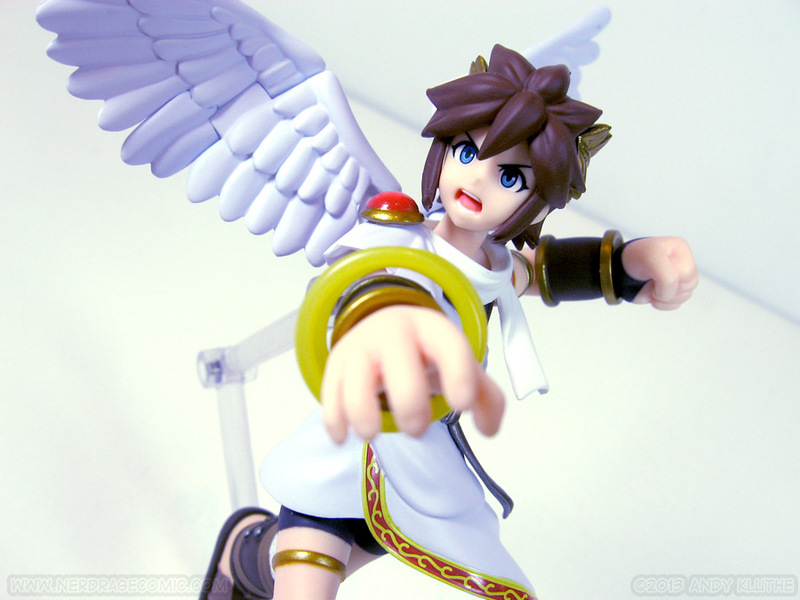 Pit has two gold rings that appear on his wrist when he equips. These rings are soft plastic that peg into small holes on his gauntlet. They also pop out if they bump just about anything. Be extra careful when putting the fist back on, because you don’t want to pinch down on the rings and break them. 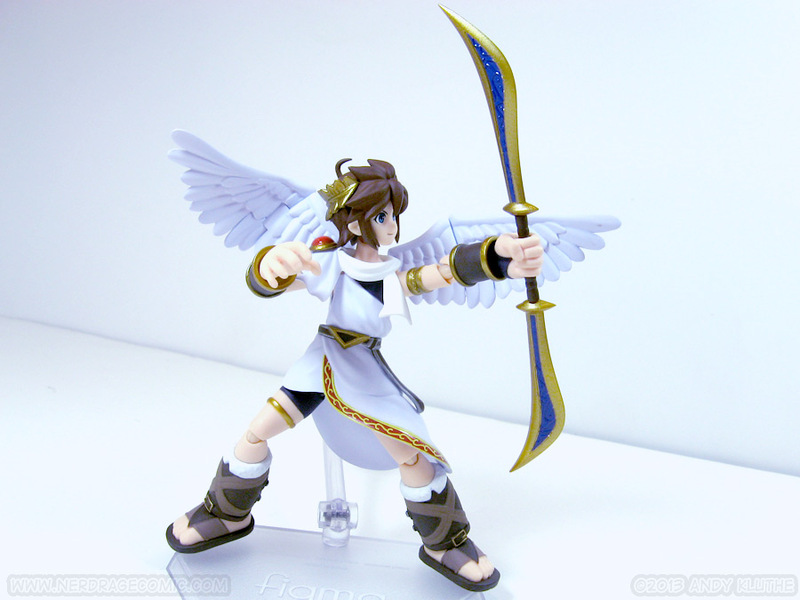 If Pit draws his bow, these two rings hover over the shaft of the arrow. You get one arrow. 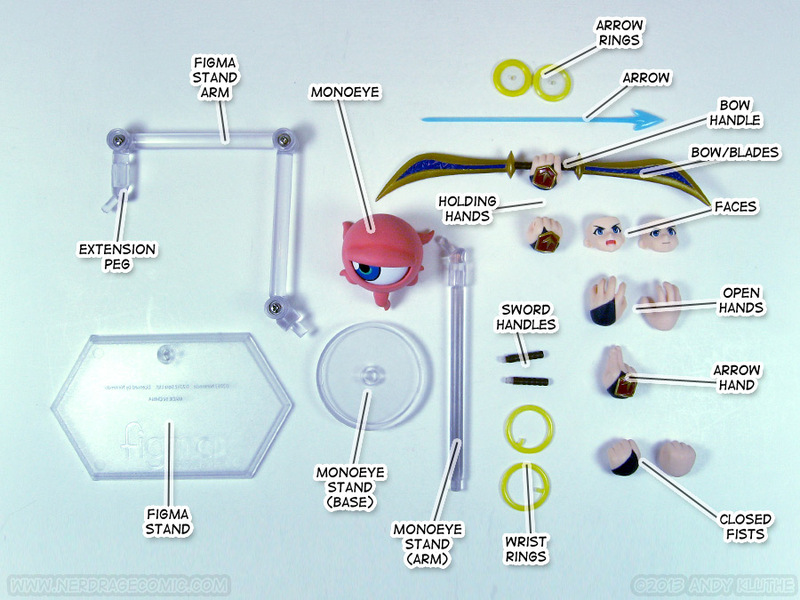 You get an alternate set of rings for the arrow. These rings are molded around a clear, hard plastic disc with a small hole in their center. They hold onto the shaft of the arrow based entirely on friction. They are a very tight fit and the arrow is very thin; I don’t think I have to be any clearer when I say be careful sliding them on (and back off, if you dare) or something will break. In my case, one ring fit just right, but the other was too tight to slide up. I rubbed a toothpick in the hole and it loosened up enough to give a good fit. • Comes with an enemy from the game. • Soft rubber (theoretically) allows flexibility. • Soft rubber is prone to cracking and wear over time. 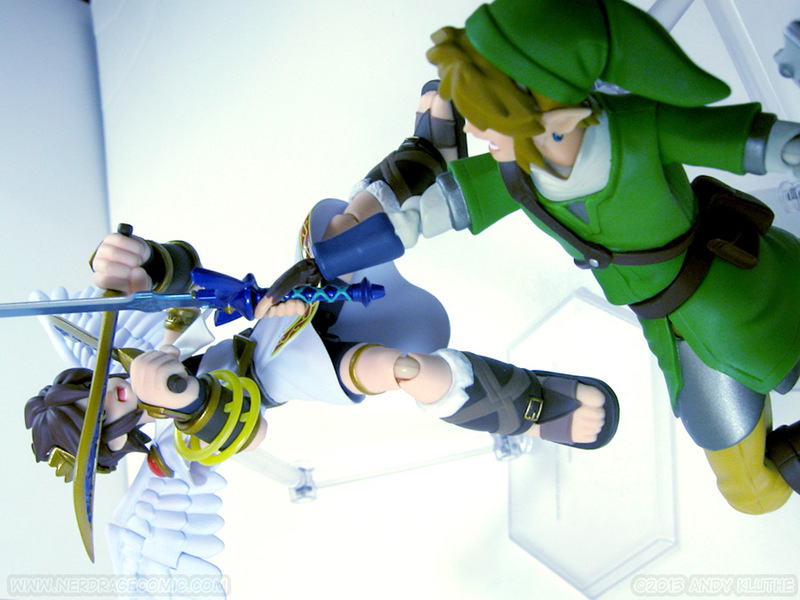 • Quality control seems lower than Samus and Link. • Right shoulder is highly restricted. • Lots of parts-swapping with small, delicate pieces. I really hope I was just unlucky and my quality control issues are an isolated case. 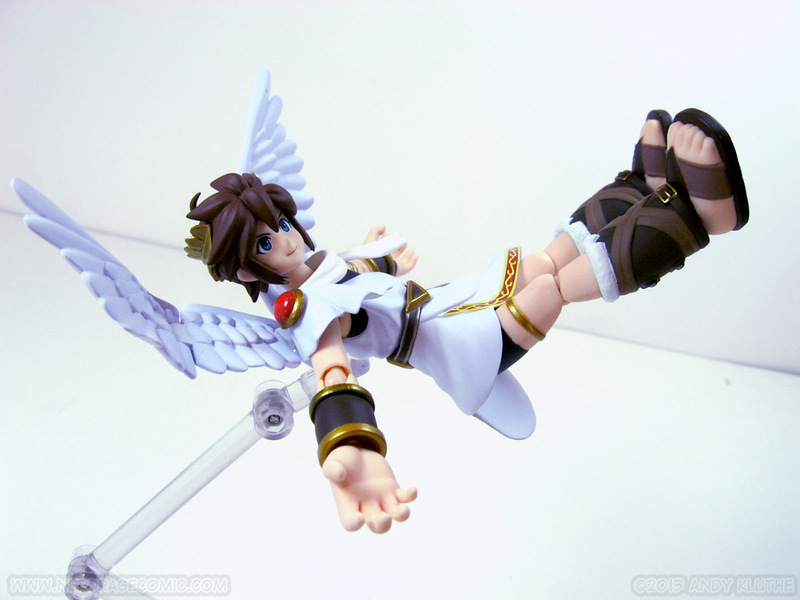 The ball joint in Pit’s torso is loose enough that his legs sometimes tumble off when suspended off the ground. The soft rubber on his shoulder doesn’t just restrict movement – on mine it seems to be coming unglued. Why this wasn’t a separate piece attached to his shoulder, rather than one solid piece wrapped all the way around his neck, I do not know. Rubber pieces always worry me, because they can crack and wear with age. Every one of his accessories is thin and fragile in some way. Not a big deal if you’re gonna set him and leave him; frustrating if you hope to repose him on a regular basis. 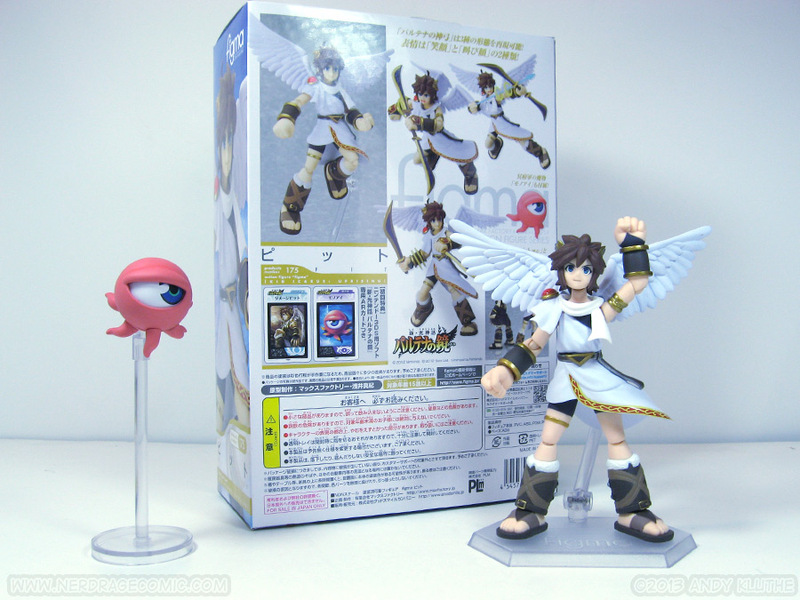 If you don’t man-handle your toys and love Kid Icarus, you can stalk Amiami or HLJ for a restock. 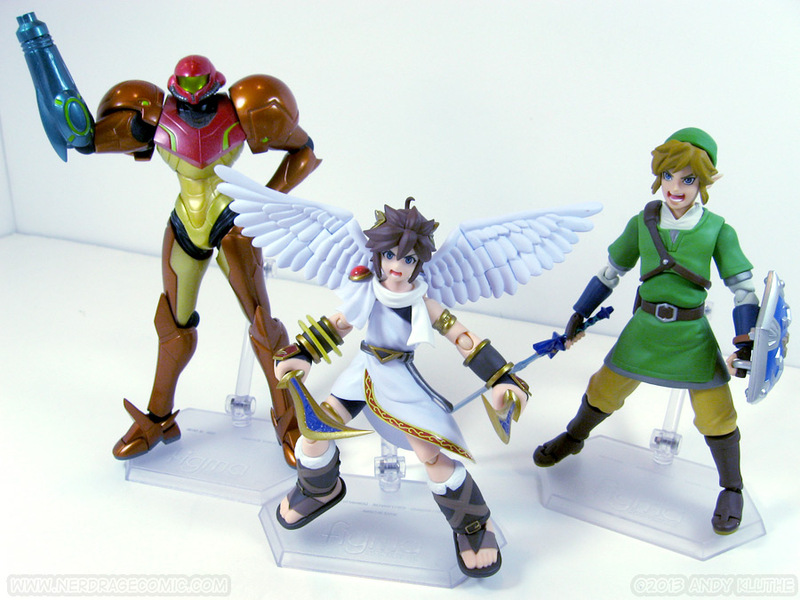 On the other hand, as I said, Samus and Link are absolutely great – and set for a reissue later this year.